So, for a couple of hours yesterday, I fell in love again with one of my greatest old friends. People are nice. 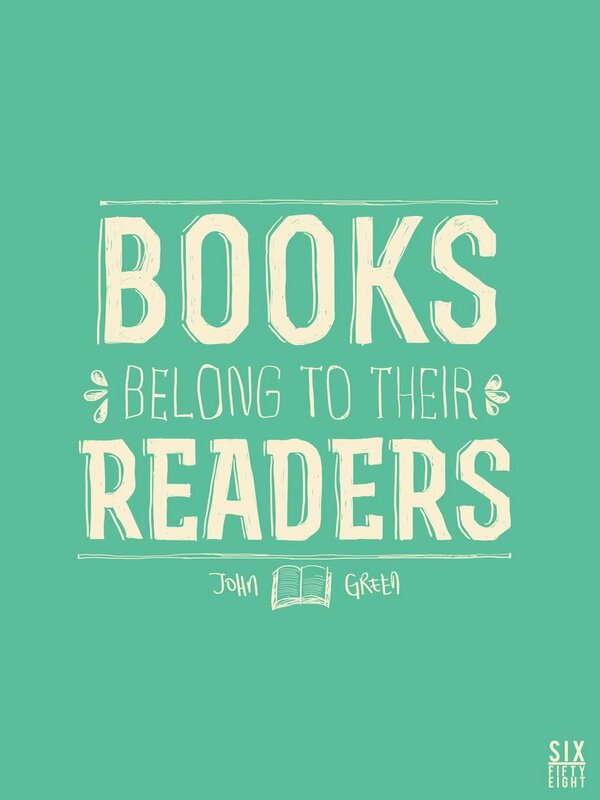 Books are better. 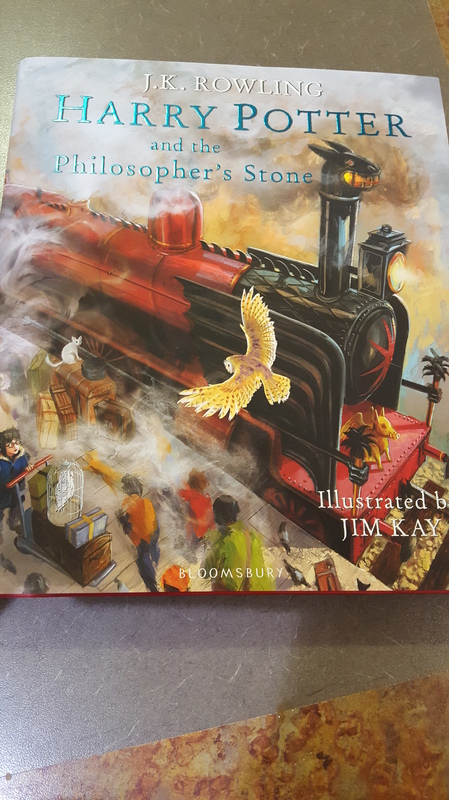 Yes, a few days ago I went to Coles and bought the Illustrated Harry Potter and the Philosopher’s Stone, and last night I sat down and devoured it, and fell in love again. I was 7 when the book was first published, but I didn’t read it until either my ninth or tenth birthday, when I received it as a gift. 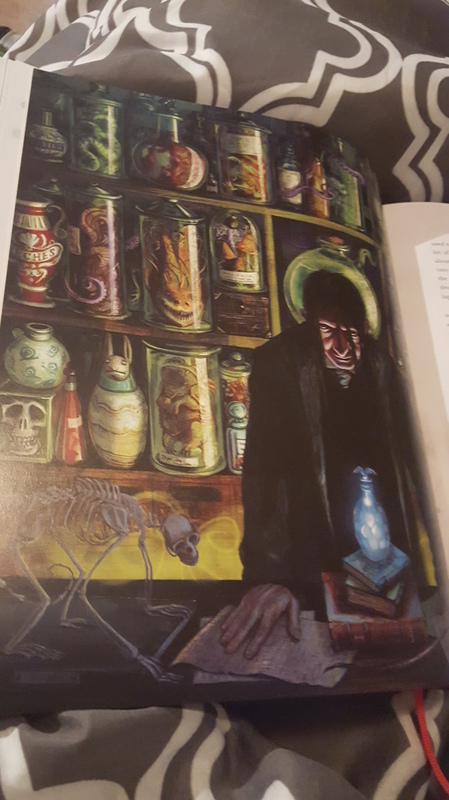 Now, the third book was already out at that point, but for some reason my 9 or 10 year old self was convinced I wasn’t going to like those Harry Potter books, and was boycotting reading them. This seems strange to me, looking back as a 25 year old, because I have always been a voracious reader, and fantasy and magic are right up my alley for books. Maybe I thought it was a “boy book.” Maybe I was going through a nine (or ten) year old hipster phase. I don’t know. But whatever it was died a pretty swift death when I finally decided I’d read that darn book, and yeah, that was it for me. I flew through it, and then called my dad – who was coming back from the States on business – and begged him for the 2nd and 3rd ones. 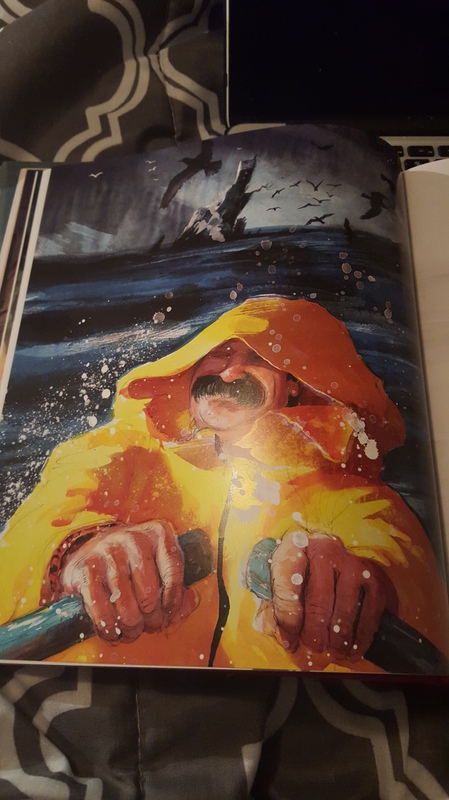 My desperation was so great that he bought them on the actual ferry from Maine he was on at that moment, and as soon as he got back, I had devoured those. I went to midnight releases. I stayed up until 5 am the next morning finishing the books I got at said midnight releases. I flipped to the last page of Deathly Hallows before I read the book. Yeah. I was that person, sue me. I’d been bitten before (also I still totally haven’t gotten over Lupin and Tonks). 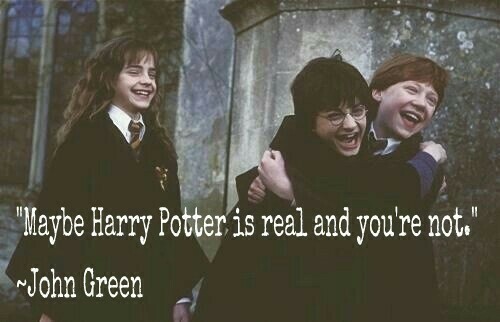 I grew up with the Harry Potter books. I was 10 (or possibly 9) when I read the first one, and 17 when I read the last one. And in those stories, I found a world I could escape to, and characters I could relate to. 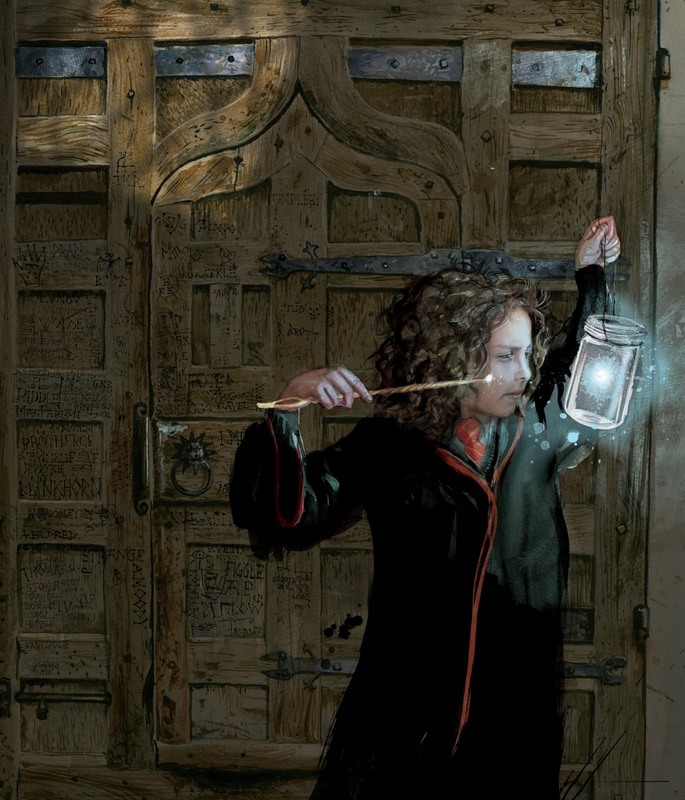 In Hermione, I found a female character, who was defined by, and proud of her intelligence. Who didn’t think of her self as pretty, but as smart, and helped save the world just as much as her male friends. 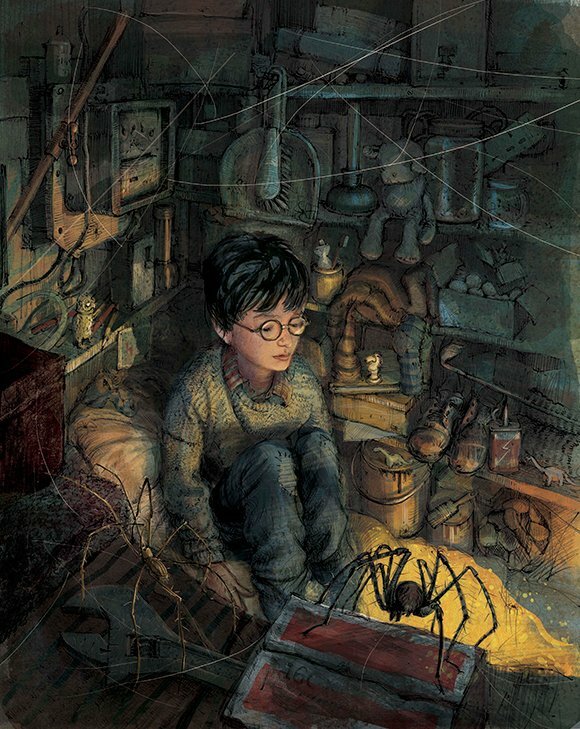 I loved Harry and Ron too, of course, but Hermione was my avatar into the story – not a shell of a character, a self insert like Bella Swan or Anastasia Steele that I could slip into like a human raincoat – but a realized character with flaws and personality that I could identify with, see parts of myself in her, and vice-versa. And I agree with this whole heartedly. My Harry Potter belongs to me, and is different from your Harry Potter, from Daniel Radcliffe as Harry Potter, or Daniel Radcliffe’s Harry Potter. My Hermione was probably a little bit more like me, just like your Hermione or Harry or Ron was probably a little more like you, because when we are reading, without visuals or sound, we are free to dream up our very own versions of these characters, similar but different; unique. Now, despite that, it doesn’t mean I don’t want so see other people’s versions of Harry Potter. As the movie clearly proved, these versions were pretty darn alright (still not over Fred either, just FYI). 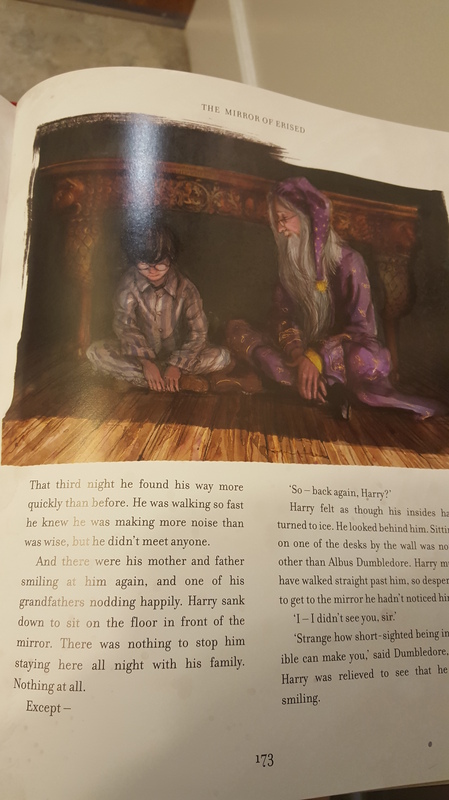 My Harry Potter isn’t diminished by other versions of Harry Potter, merely enhanced, and so when I found out that they had released an illustrated version of the first Harry Potter book, with art by Jim Kay, I couldn’t wait to read it. Another chance to revisit my old friend, and to marvel at some spectacular art while doing so sounded pretty perfect to me. I’m glad to say that it didn’t disappoint. 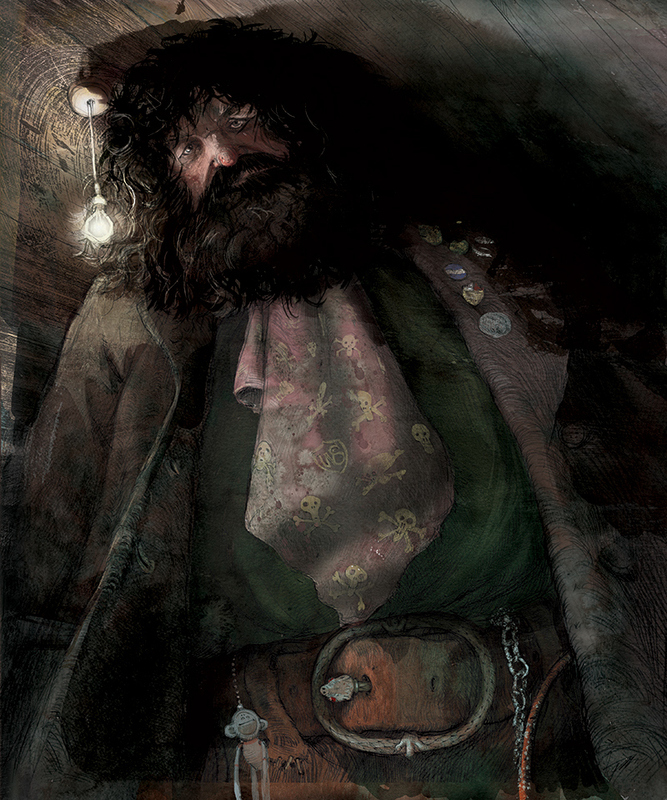 The lush colour of Hagrid’s hut and Platform 9 3/4. Hagrid the gentle giant and Malfoy, being a pompous little tool while fitted for school robes. 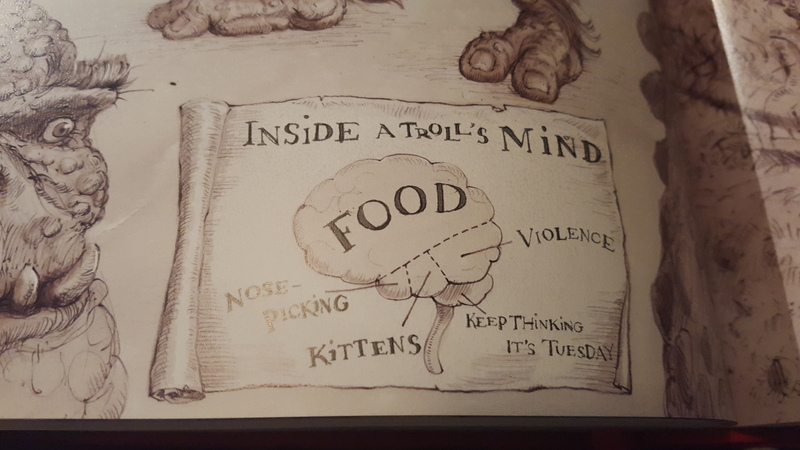 The biggest laugh I got out of the whole reread; one page of illustrations is about the troll in the dungeons, like a textbook, and this little illustration at the bottom says that a part of a troll’s brain is dedicated to “kittens” and yeah, I was dying of laughter. 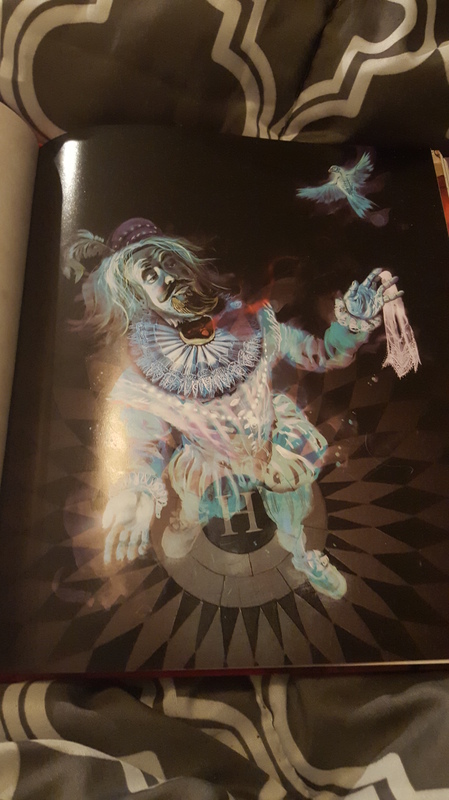 There was all that, and many, many more, and each page was – if you’ll pardon the pun – spellbinding. 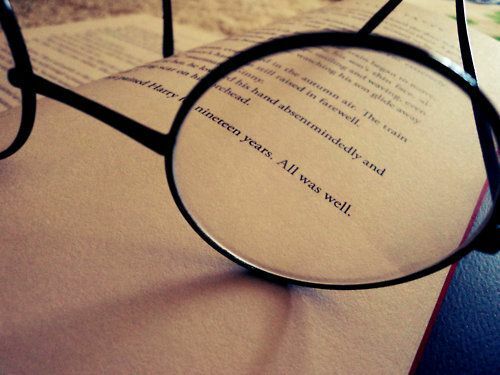 It reminded me why I’d loved the books so much the first time around, and made me only want to read them again. That is an endeavour I think I’ll wait on, though, as the rest of the series is apparently going to be released in illustrated form, one book a year over the next 6 years. 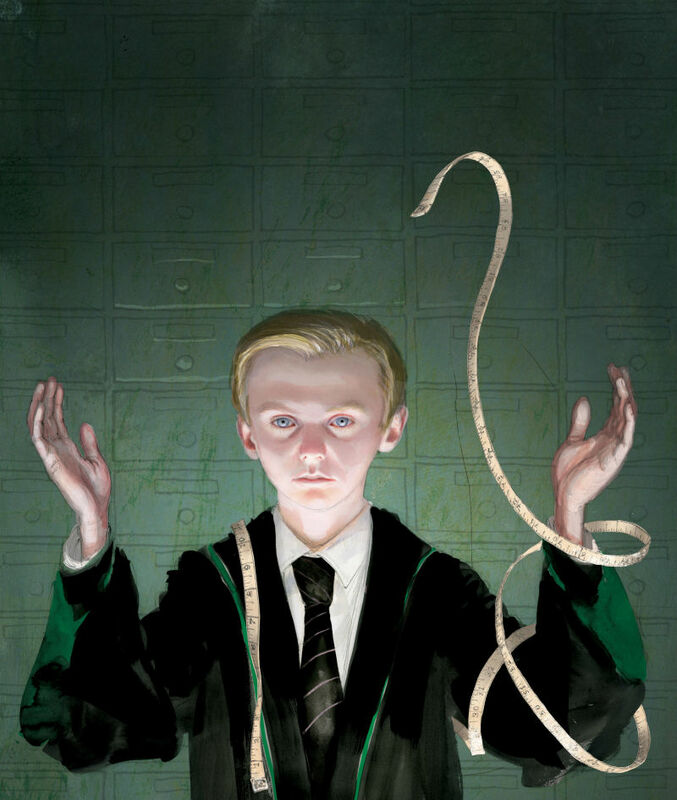 I can’t even imagine how big the Deathly Hallows version of that will be – and it will probably weigh a ton! 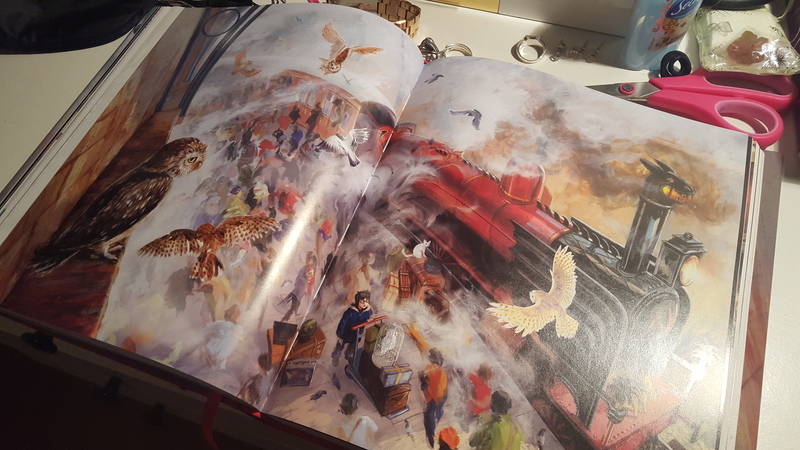 – but I don’t care; I’ll be there, 31 years old to buy that book, because the love we have for books is timeless, and because I know that it will still be magical. Harry Potter – not the character, but the experience – is real to me, and that’s more than enough. 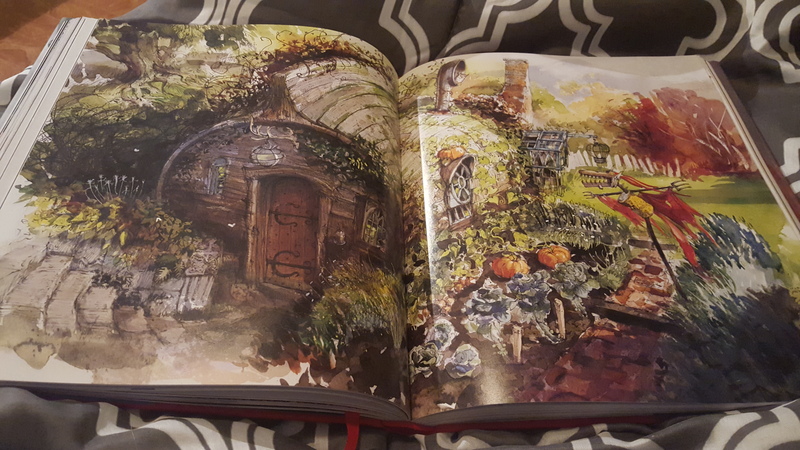 Thank you for the sneak peek into the book! I wouldn’t be able to afford it here, but I’m really itching to own it. That was very touching! 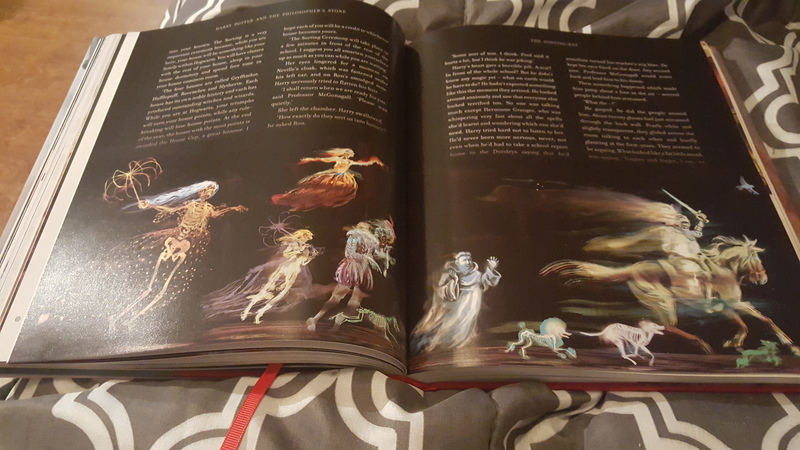 And the book is absolutely gorgeous! Thank you, I just have all these fond emotions about this series 🙂 And yes, it’s utterly beautiful, and in my opinion totally worth the purchase if you can swing it! Funny you posted this when you did. 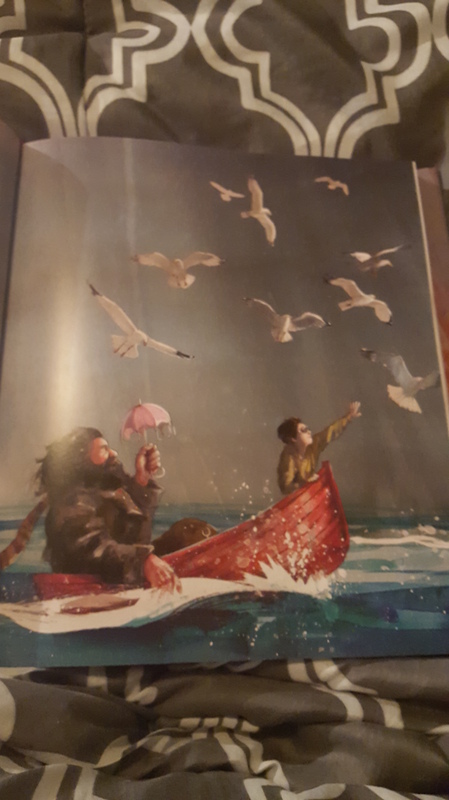 We were just at Chapters yesterday getting our son a certain book in French that he wanted to use for his book report when we saw the illustrated Philosopher’s Stone, which we’ve been reading as a family. I wish I could’ve justified the $40 it cost. It is gorgeous. Harry Potter was a very big part of my late adolescence and early adulthood. I read Deathly Hallows with my six month old son in my lap. I think they are very special books which will be loved for generations to come.